At least 6 hours before serving, or the night before, rinse 2 cups rolled oats and cover generously with water (I filled my measuring cup to a total volume of about 4 cups). Add a splash of lemon juice--a teaspoon to a tablespoon. Let soak. Refresh your sourdough starter by adding equal parts (by weight) of flour and water to make at least 2 cups total. I had about a cup of starter, and added 3/4 cup flour and a little over 1/2 cup of water to mine the night before. According to Nourishing Traditions, soaking and culturing the grains denatures the antinutrient phytates in the grains and makes them more digestible. While beating oat mixture, sprinkle baking soda over batter to mix in. Fry over medium-low heat until bubbles on the surface pop but do not refill. Flip pancake and cook to desired level of brownness. Serve as is or top with yogurt, preserves, or butter and maple syrup. Dal, or dahl, has any number of variations. This version is made with the lovely, mild and quick-cooking red lentils. The flavors are mild enough for my family's blandness-loving palate, although I would have liked it a bit more spicy myself. If you like more spicy foods, try doubling the cumin, turmeric and/or mustard. You could also add a clove of garlic and a sauted onion, or your favorite vegetable(s). If you are allergic to a spice, just leave it out or substitute something you like. 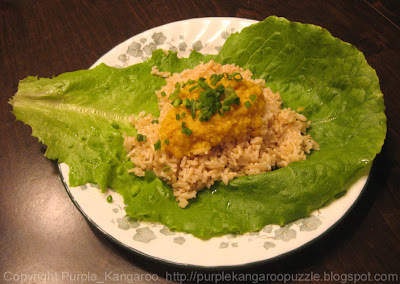 Any grain can be used instead of rice, or you could just serve the dahl as a sauce over lettuce, tofu or meat. Serving a legume with a grain, such as rice, makes a complete protein. Soak 1 cup of red lentils (hulled and split), or masoor dal, overnight in about 4 cups of water and the juice of half a lemon (about a tablespoon) or a splash of vinegar. If you will be serving the dal over rice, soak the rice in water as well (I soaked 2 cups of rinsed brown rice in 4 cups of water for almost 24 hours). This step is optional, but disables the antinutrient phytic acid in the grains, making them more digestible. Drain and rinse the soaked lentils, combine with 3 and 1/2 cups of water (4 cups water if you didn't soak them), and bring to a boil. Cook for about 30 to 45 minutes or until lentils are tender. Serve on flatbread or over cooked rice. I started the dal cooking and then put my soaked rice into the rice cooker, and they both got done about the same time. This dal is very good served over cooked rice. I cooked 2 cups of soaked brown rice with 4 cups water and 1/2 teaspoon sea salt. To serve as in the photo, start with a bed of leaf lettuce. I used one large leaf with more salad on the side, but a thicker layer of lettuce ripped into bite-sized chunks might work better under the dal. Put a good-sized portion of rice on top. Ladle a spoonful of lentil mixture over the rice and garnish each plate with chopped green onions or chives. If you can tolerate dairy products, you might want to try making the dal more spicy and adding a spoonful of sour cream or plain yogurt under the green onions. Grease an 8 x 8 pan or a cookie sheet, or lay out waxed paper on paper bags. Get out candy thermometer. Measure out 4 cups of puffed grain or cereal (I used puffed rice). Cook over medium heat, stirring constantly, until candy thermometer registers 250 degrees Fahrenheit. Remove pan from heat and stir in cereal until well coated. Pour into greased pan for bars, or quickly drop by spoonfuls onto waxed paper or greased cookie sheet for cookies. Allow to cool and enjoy! If you leave the cereal out, this might make a good hot fudge topping. If cooking in slow-cooker, put on the lid and turn on the crockpot. I put this soup together in the afternoon and cooked it on low for 2-3 hours and then on high for a couple more hours, and it was getting quite soft and mushy by the time we ate it. If you are making it in the morning, I would think cooking on low all day should be fine. If cooking on the stovetop, bring to a boil and then turn down to a simmer. Simmer about 1 hour. When the lentils and rice are tender and all ingredients are heated thoroughly, the soup is done. The lentils and rice make a complete protein, so the sausage is completely optional--it's added more for flavor. You can leave out the meat for a vegan dish. Other flavors that might be good in this soup would be a sprinking of black pepper, some basil and coriander or anise seed, or a touch of honey.